Long ago I stopped comparing myself to other bloggers. I can’t get it together to make my meals look like they’re from a magazine shoot. I want to take better photos, but I also have a list of at least 20 other things I’d probably rather do instead. And I’m certainly not one to keep at a regular schedule. I want to post more, but life gets in the way. Right now, I have a back log of tasty recipes that I want to share, but I just can’t get all the words together. Sometimes the words come crashing onto the page, but other times, I don’t know where to start. And sometimes I just want to go for a walk in the woods with a few friends. Blogging on the reg can be hard. I know, I’ve been at it since 2005 and I’m still chugging onwards. But cooking and baking? That’s pretty easy for me to do. The other day I baked up some of my favourite peanut butter cookies (flourless & made with natural peanut butter) from my archives. I made a potato salad that was amazing but I forgot to take a photo of it (dang!). But there’s some notables coming soon, I promise! There’s an amazing farro salad, plus some brined & bbq’d pork chops, a cold-brewed iced tea, a sweet & sour broccoli slaw recipe, lemon & blueberry scones and my long-ago birthday carrot cake to tell you about. But I made this for dinner last night and it got me all worked up. 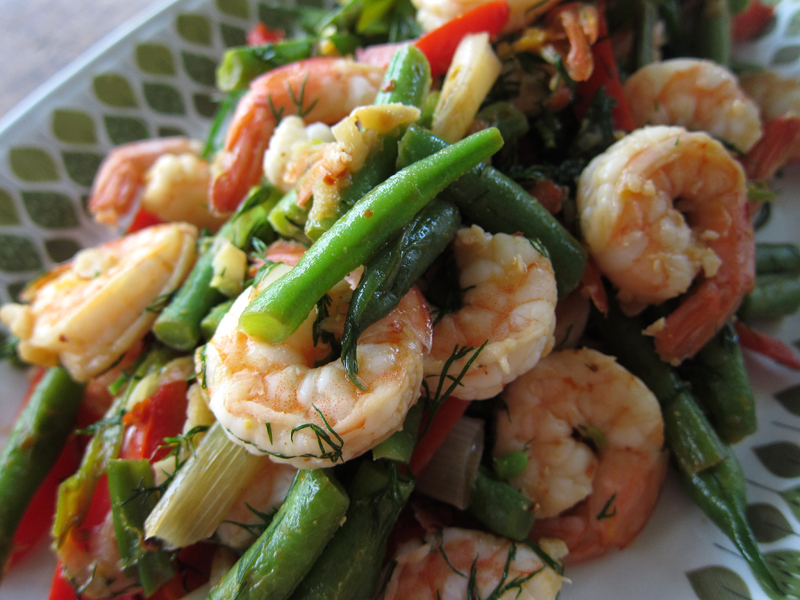 Garlic, green beans, red pepper, green onion, shrimp, lemon and lots and lots of fresh dill. Say hello and get friendly with your next meal. Well, if you eat shrimp, that is. Otherwise, stay tuned or take a peek through my recipe index. I should start out by mentioning that this meal was going to be quite different. I had broccoli on the brain and could have sworn I had some in the fridge. Nope! But I did find some green beans and green onions and decided to switch things up. 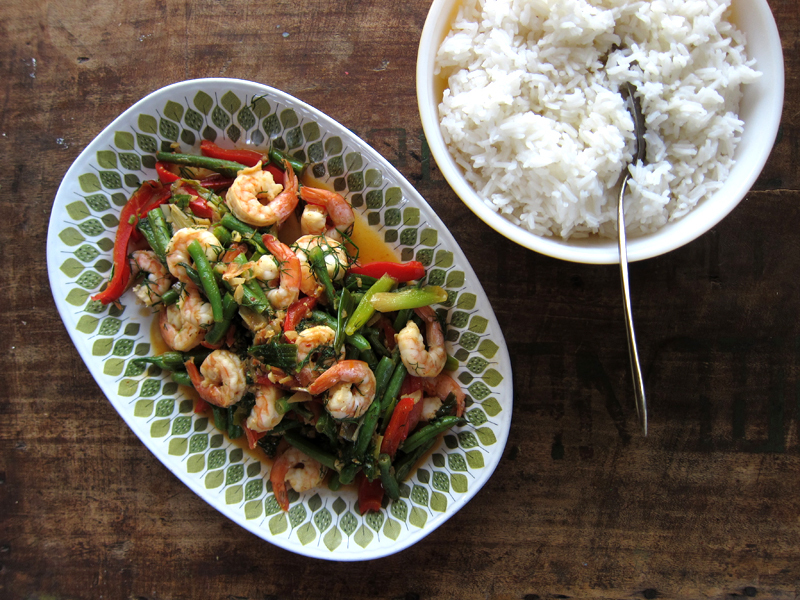 It’s just a simple stir fry but there’s a lot of garlic and shrimp which fancies things up. You could totally serve this to guests and they’d be impressed. There’s a bit of chicken stock and soy sauce to help create a sauce, while aleppo pepper adds a gentle heat. Lemon zest and juice are a natural fit because, duh…shrimp!! And because I bought a giant bunch of dill on the weekend, in went a whole load of it and it was a great addition – though I’m sure fresh basil if you had any on hand would also be a good herb to add. But try the dill! It’s lovely and a little unexpected. Oh baby, come to mama. 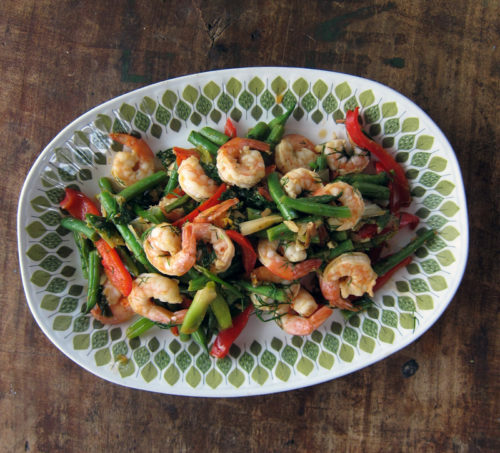 While this could be considered a side dish, serve with rice (or even pasta) for a fresh and filling dinner. 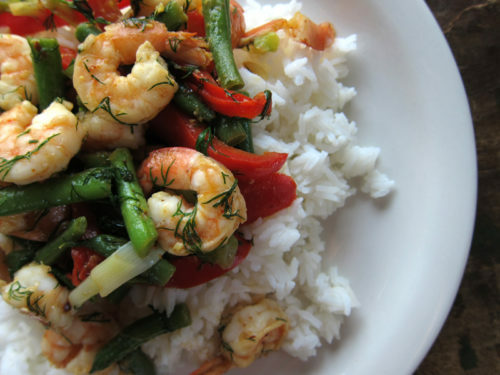 This meal is gluten-free ONLY if you use a g/f soy sauce, otherwise, hello gluten! In a large skillet or wok, heat oil over medium-high heat. Add in garlic and saute for 30 seconds. Add in the green beans, red pepper and the white parts of the green onions and heat, stirring often for a minute or two, until the green beans get a bit brighter in colour. 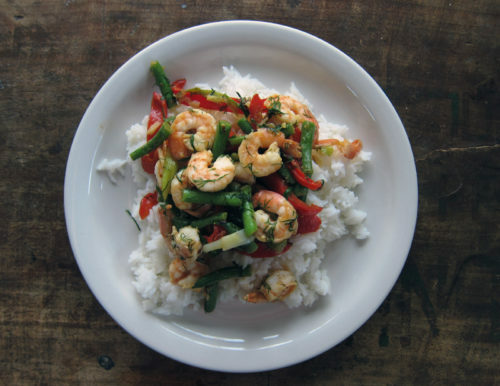 Sprinkle with soy sauce and aleppo pepper and add in the shrimp. Let the shrimp get a little pink, about 1 minute or so, and then add in the chicken stock. Cook for a couple of minutes until the stock reduces somewhat and then squeeze over the lemon juice and lemon zest and cook for another minute. Add fresh dill and toss. Serve immediately. Serves 4 people (or 2 in this house). I would never have thought to use dill in a shrimp stir-fry–but now I’m wondering why not, since it goes so well with most fish. This sounds like a perfect & very fast lunch! Lady, post whenever it works for you! Especially if you show up with recipes that look like this. Yum. I love it when a meal inspires me so much that it makes me feel compelled to blog about it! Definitely the hallmark of something delicious. It’s beautiful! I also love the leaf-pattern dish. Do you know the maker or pattern name? Thanks. I think this might be my lunch next week, it sounds so good! Eileen, I never thought about dill either, but it was soooo good! Heather, thanks. I love that dish a whole lot too. I thrifted it but it says “spanish crown ironstone” on the back which should give you plenty of google results! Thanks Whitney, it is so good and would make a perfect lunch. I know some say shrimp are bottom feeders and we shouldn’t eat them…and all that other anti-seafood nonsense talk but I love snacking on these little guys. Too bad I just finished off a bag of shrimp the other day. I steam them and then eat them with sriracha mixed with some mayo. I really like your version with the lemon zest and dill though. It’s a definite shrimp flavour enhancer! That looks great! I am really into shrimp these days, and I would love to mix it up a bit. I like your photos! As long as the food looks tasty (and it does) that’s all that matters!How was Alice Lake? I always wanted to go there. Joanne, I don’t eat shrimp very often (though I’d love to!) because of $$$, but I love ’em when I have them! This version is great, but I like yours for simple snacking!